Most of the pain that flutists complain about (and myself personally experience) comes from what we call the left shoulder. If we’re to get specific about it, most of the pain usually originates from the rear of the shoulder in the muscles of the rotator cuff and the rhomboid, specifically. If you look to the left you will see the muscles that lie on top.Â If you look to the right, these are the muscles that lie underneath. Look at this picture, can you identify exactly where your pain is? These lovely little muscles can be the source of a LOT of pain for people. As you can see, the connect the inside of your shoulder blade to your spine, and their job is to cause the blades to retract, or come together. 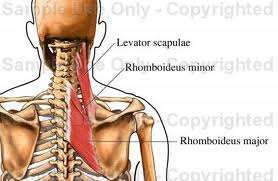 Pinch your shoulder blades together and that’s the rhomboids doing their job. When your chest muscles are too tight, these guys can get stretched and weak. When this happens, you might get a sharp pain that can travel through your shoulder and even down your arm. You might even have a knot here. With the exception of the Teres Major, these muscles make up the rotator cuff. I’m sure you’ve heard of it before, but had no idea what it does. It does a lot of things, but for our purposes here what you need to know is how it works so you can play your instrument. The rotator cuff muscles main job is to lift and rotate your arm and keep your shoulder stable within its socket. For flutists, this is why the left shoulder tends to hurt more than the right shoulder, because we bring our left shoulder up and rotate it in front of us to be able to play. This is the job of the rotator cuff muscles. As you can see, they are very tiny muscles, and holding up an instrument for a long time, especially when their assisting muscles such as the lower traps and rhomboids are already stretched out and weak puts a great strain on them. Compound that with overactive traps and chest muscles and you have a recipe for disaster just waiting to happen. Actually, this will show you exactly how the shoulder blades. As this video is playing, put your hands on the muscles that are moving and do the movement yourself.Â Do you see how your own body works? [youtube=http://www.youtube.com/v/rRIz6oOA0Vs?fs=1&hl=en_US] The Antagonists: The ones partially causing the pain! Put one hand on your chest, near your shoulder. You probably notice that the front of your shoulder tightens and so do your chest muscles near the shoulder joint. Does this resemble how you might look after spending too long at the computer, or driving? If you hold this exaggerated position for long, things will start to hurt. You’ll notice pulling in your rear delts, and your chest will get sore. What’s going on here is a chronic muslce imbalance between the front of our bodies and the back of our bodies, called the frontal plane (or frontal chain and posterior chain). What happens is that the muscles bringing the arms forward cause the muscles in your rear shoulders/back to get stretched. Over time, these rear muscles become weakened due to being in a stretched position for so long and not being contracted. The frontal chain muscles of the chest/front delt get tight because they are contracted for TOO long. As you watch these videos, can you see the motions you use to play your instrument, drive, type, eat, fold laundry, etc. and how doing so much of one movement, and not enough of the opposite can cause you pain? The jobs of the traps and levator scapulae are to shrug the shoulders upward and the job of the lower traps is to bring the shoulder blades downward. The traps are actually divided into 3 sections of fibers: upper, middle and lower. Most people have overactive and/or overdeveloped upper traps. Please don’t do shrugs, there’s no need. What you NEED to do are get your lower traps firing, because not only are most people not aware that they are there and have a separate job to do, most people’s lower traps do NOT do their job, which is to bring the shoulder blades downward. if your shoulders come up towards your ears, you’re doing it incorrectly. Done correctly, you are performing shoulder blade depression and retraction and activating the lower trap fibers and rhomboids. Your chest should stick out and there should be space between your shoulders in front. Does that feel weird? If so, good! You’re probably doing it right! This position is the first position of good form for all weightlifting exercises. I’ll cover that in another post, but knowing about it now can save you a world of hurt, just by understanding how these muscles are designed to function. Now that we know where and why, how do I stop the pain? There are a couple of things to note. You have to know is your pain a muscle pain or an actual injury? If this is something that has been bothering you for awhile, I highly recommend going to see a doctor of some sort first before self-diagnosing. This type of doctor can, of course, tell you if anything else is wrong with you. Your source of pain could not be what you think it is and it could actually be a nutritional deficiency or other abnormality. This doctor can also tell you if what you have is an actual injury. If you have an injury, you may or may not want to take medicines prescribed to you by this type of doctor (such as muscle relaxers) and you may also get prescriptions for further testing such as an MRI or a script for therapy from a Physical Therapist. These people will treat your injury by strengthening the surrounding muscles and rehabbing the injury itself (PT’s out there, feel free to chime in here on what else you do!) They may treat you with various modalities including stretching, light weights, heat, ice, massage or electrical stimulation. If you have a real injury, this may help. These two are NOT the same, do not get them confused. A massage therapist also does more than “feel good massage” or Swedish Massage. Most of the massages I have had in my lifetime were anything but “feel good”! A massage therapist may provide techniques such as deep tissue massage and trigger point therapy. They can manipulate the fascia around muscles if it has become stuck, trigger point will release knotted muscles and besides freeing up an injured area of knots, massage will also increase blood flow to the area and increase lymph flow, which takes away waste materials from the muscle. Trigger points are sometimes thought to be areas of waste materials that have gotten blocked. Now, if you have an injury, you must get that rehabbed first, or get a doctor’s note to provide to your personal trainer letting them know exactly what is wrong and what you can and cannot do.Â If you are not injured, you may be suffering from either Overuse Syndrome or Muscular Imbalances, either of which can be helped by a personal trainer. A good trainer will not only educate you in stretches that will help you release the antagonists that may be causing your problems, they will also show you corrective resistance training exercises that will strengthen your weak muscles. When your rhomboids and rotator cuff muscles (among others) are stronger, not only will you be able to play for a longer time without pain, you can become and stay injury-free! Add to this the benefits of better body awareness and you have a body that is better prepared to deal with the demands of being an instrumentalist. As a shameless plug – I have availabilities for in-person and online training so you can get one-on-one training programs designed specifically for you. See the next post: Shoulder Pain Part 2 for stretches and exercises you can do on your own to alleviate shoulder pain. This post is made with the knowledge that I am not a medical practitioner of any sort, and therefore cannot prescribe anything.